Marc Marins is a 1st degree black belt in Brazilian Jiu Jitsu with over 25 tournament victories on his resume. He began training in 1996 and made the trip to Brazil the next year to train with the best Jiu-Jitsu fighters and coaches in the world. He has since returned to Brazil many times and has competed in the World Championships, the Pan Ams and the U.S. Open. Marc is also a black belt in judo. 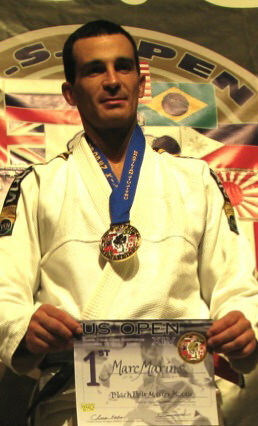 Marc's most recent wins include gold at the 2008 and 2009 U.S. Open, a silver at the 2010 Pro League Jiu Jitsu tournament in Sao Paulo, bronze at the 2011 Pan American Championships and silver at the 2011 U.S. Open BJJ Championships. Marc is co-owner and co-lead instructor for his club North Vancouver BJJ which opened in 2008.